In 2016, PVAS began a campaign to protect Chimney Swift habitat on the Shepherd University campus, when concerned community members learned that one of the West Virginia’s largest Chimney Swift roosting sites, Sara Cree Hall, was set for deconstruction. Upon raising awareness and reaching out to local stakeholders, PVAS has committed to ensuring Chimney Swifts will continue to have roosting habitat on the Shepherd University campus. PVAS has since successfully “RAISE(D) THE ROOST” and constructed a new roosting structure near the storm water retention area off University Drive. The area will have abundant food availability and will not be developed in the future. The new tower was built in March 2019 prior to the return of the Chimney Swifts for the breeding season. PVAS secured a generous loan in order to construct the tower as soon as possible to help this globally significant species. PVAS is continuing to fundraise to now pay back this loan. If you are interested to learn more, get involved and support the “RAISE THE ROOST” project please contact our Land and Conservation Manager, Katelyn “KC” Walters (Katelyn@PotomacAudubon.org). Chaetura pelagica are a neotropical migratory bird that migrate over 6,000 miles from the Amazon Basin to North America for their breeding season. Their small, slender bodies make them magnificent fliers, and they are also phenomenal natural pest control agents, consuming more than 3,000 insects per day! Historically, Chimney Swifts nested and roosted in standing dead tree trunks, but with the decreased availability of old-growth habitat, they adapted to the urban environment and used chimneys as nesting and roosting habitat. Unfortunately, as historic buildings are removed and chimneys are capped the swifts’ urban habitat has declined in availability. They have suffered a 65% population decrease since the 1960’s, and are classified as “near threatened” by the International Union for Conservation of Nature. PVAS hired Alpha Associates to develop engineering documents for the project. The design (lower left photo) includes an access panel for cleaning and can support video cameras to view the inside of the tower. This access will allow us to gather information about the roosting swifts, which will also benefit ongoing research about the Chimney Swift species. We are proud that this will mitigate habitat loss, and contribute to conservation science efforts. The research opportunities from the tower will provide new resources Shepherd University students, local and international scientific inquiry. The tower design was modeled after a swift roosting tower built by Wake Audubon in North Carolina (lower right photo). Their roost was successful in the first year upon competition and each season the roost grows. We expect that our roost will also have quick re-habituation after the tower is constructed. PVAS then hired contractor, Jim Schmitt of Schmitt Construction Company to construct the tower. Jim modified the original engineering plans to allow the tower to be economically feasible for construction. In lieu of bricks, the tower was constructed with stamped concrete that is designed to resemble bricks. This innovative tower model retains the same 100 year lifespan and also provides the Swifts with their ideal roosting habitat. The tower is built near the stormwater retention ponds on the north side of Shepherd University campus. Site selection was determined with the input of Shepherd University advisors and after a thorough soil and topographic assessments. 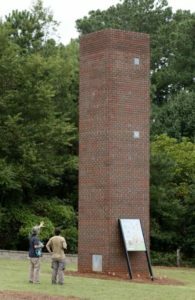 The State Ornithologist with the WV DNR, Richard Bailey, has looked at the site and has deemed it an excellent location based on the needs of the Chimney Swifts. Getting consensus around these details is critical to ensuring the sustainability and longevity of this investment. The partnerships and community support surrounding this project confirms what a remarkable community we have in the Eastern Panhandle of West Virginia. PVAS members have monitored Chimney Swifts in our region for decades. We have identified several habitats that Chimney Swifts occupy and are always looking for more. Join us every August and September during the “Swift Night Out” events, where we monitor roosts and count Chimney Swifts! The data collected will contribute to nationwide surveys and databases, for use by researcher and ongoing conservation efforts. Review the “additional information” provided at the bottom of this page to learn more. Donate to PVAS and help RAISE THE ROOST! 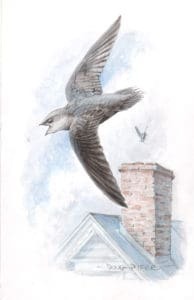 Article: What’s a Chimney Swift without a Chimney? Herald Mail Media: Historic Shepherd hall could be demolished-along with bird..